LAST year after the performances of the East Down runners in the NI Relay Championships I wrote:- “A superb effort all round which will surely encourage wider participation next year” writes Joe Quinn. Michael and Christopher O’Connor, Daniel Atkinson, Edie and Ella Carroll and Owen Edwards with Dame Mary Peters at Victoria Park on Saturday. So much for my prowess as a prophet, for in spite of the appearance of 83 teams in this year’s renewal, none were from the County Town club. Last year 5 teams from EDAC took part in spite of cry offs through illness and injuries, this year the reasons for our absence are unknown. The most annoying aspect of this No Show is that we could easily have won the Mixed category and probably picked up a top three position in the Master’s category. But why complain? This is not a prediction but Next Year we’ll be there even if it means parking the Zimmer and fitting stabilisers. On a brighter note I can only hope that everyone is conserving their energies for an assault on the Cross Country League which kicks off on Saturday 19 October with the Springwell AC promoted event in the University campus in Coleraine. At least the Junior members were not put off by the prospect of some competitive racing on a day which proved to be warm, sunny and dry. Michael O’Connor 18th in the Primary Schools Boys 800 metres, Edie Carroll 10th in Under 13 Girls over 160 metres, big sister Ella 11th in the Under 15 Girls with the ever improving Owen Edwards 11th in the Boys equivalent with Daniel Atkinson 12th and Christopher O’ Connor continuing his comeback a few places behind that. And to round off a highly enjoyable day all the boys and girls had their photograph taken with the lovely Dame Mary Peters. What an inspiration she continues to be as her enthusiasm and energy puts to shame many who are barely half her age. On Sunday the Runher Women Only 5 and 10K races were held in the Stormont Estate with Sharon Carew posting a fine 30 minutes in the 5K and Carmel Tumelty improving her time by 7 seconds from last year to 29.13 over what is a challenging course. It’s the Dundrum Gr8 Race next Saturday and as ever a big turnout from East Down is expected. I’ll be there spectating, which is a poor substitute for running – but next year? 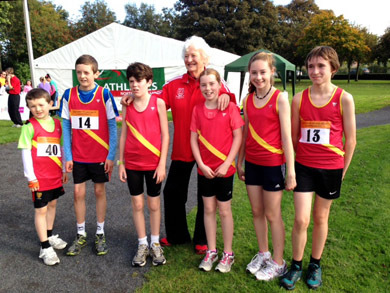 Here’s a challenge – it might be asking a lot for any of the local clubs to mount a serious challenge for a place on the podium in the forthcoming Cross Country League but how about the “locals” East Down AC, Newcastle AC, Murlough AC and Ballydrain Harriers, now that they’re re-established again, having they’re own Lords and Ladies of Down contest within the framework of the League using the same scoring system with bonus points for numbers of finishers etc? A sub set of placings covering just the 4 clubs would lead to the award of points for finishing 1st to 4th in the Co Down group. Prizes to be awarded to winners e.g. free entries to Jimmy’s Ten, but mostly the victors would have the bragging rights for a year!